Instead of going with a top ten list like everybody and his brother, the Detroit Autorama narrows things down to 8 finalists in the hunt for the prized Ridler Award. This group of fresh hot rods live in what's called "the Great 8". We've already seen the winner of this years Ridler Award, the Ferrambo, but we're going to take a tour through the other selections for this years Great 8. 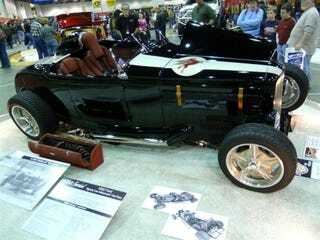 This is the 1932 Ford "Willet Special". Styled after the racers of the late forties which were bodied and modified for speed as "specials", the Willet Special has something under the hood those original racers could only dream of. Scoffing at the laws of physics, the builders of this speedster have managed to wedge a Viper V10 into the narrow frame and hood line of this handsome coupe. With the power of 600 horses this Special is capable of over 200 mph, and with less heft than the Viper, will throw down 0-60 MPH times under 4 seconds. Not bad for a 76 year old chassis. Of course it's got all the goodies to back that up like a one off belly pan, rear splitter, Tremec 6 speed, roll hoops, a Willwood braking system and some swank satin polished vintage style kidney wheels. This is a baaaaad ride my friends.